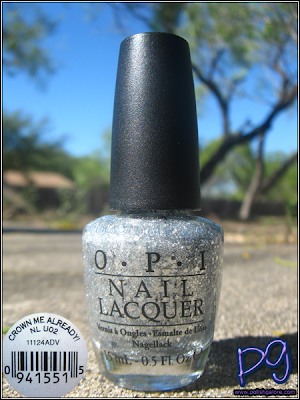 Going back to OPI's Miss Universe - now it's Crown Me Already! 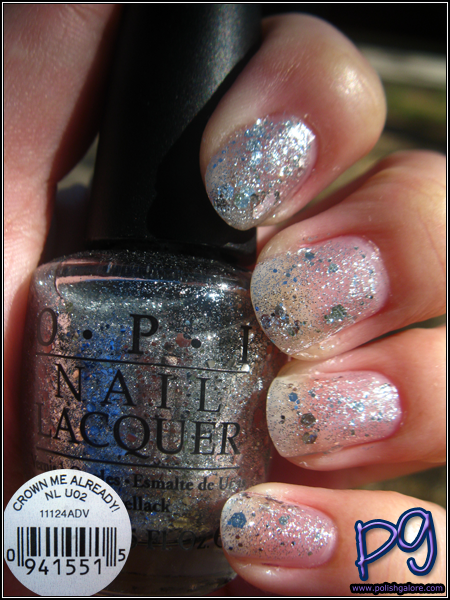 a multi-sized glitter in a clear base. Honestly, this polish looks best layered either over another color or over itself, but I didn't know that until I swatched. I used OPI Natural Nail and then put 1 coat on my pinky, 2 coats on my ring finger, 3 coats on my middle finger and finally 4 fantastic coats on my index finger. I sealed all with OPI Top Coat. In the sun, you can see that oddly, it doesn't seem to matter if there's 1, 2 or 3 coats... it's either 1 coat or like... 4. I don't understand it, haha. The larger hexagonal glitter was a bit hard to get onto the nail but I was able to get it there eventually. In the shade - same story. This was before I got my manicure (as you can tell) but tomorrow, you'll start to see how much my nails grew! (Sadly, these pictures are like 6 weeks old... I'm a bit behind right now). 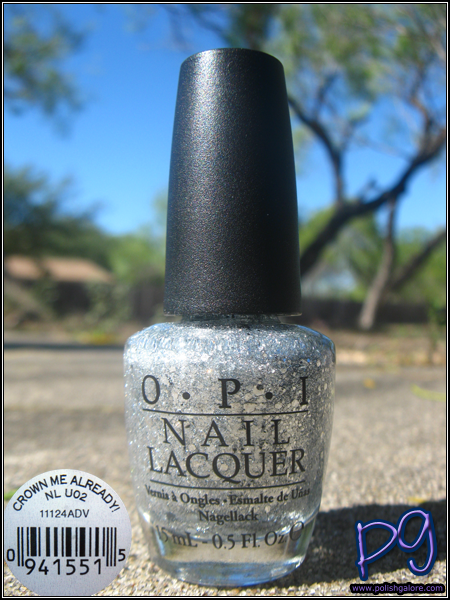 As for this polish, I can't wear it on its own - I need it to layer. 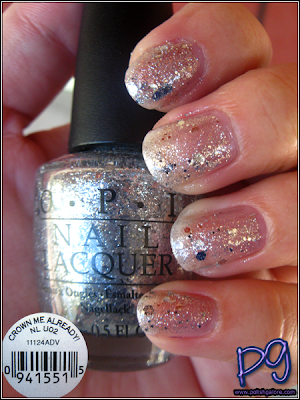 Frankly, I'd prefer to wear Servin' Up Sparkle if I wanted a glitter like OPI layering polish. That's odd. If I try to layer with my bottle of this polish, I can barely see my base colour with just one coat. Mine is ridiculously dense yet the consistency doesn't seem thick or anything. I wonder which way it's actually supposed to be? Hhmmm, I think this would need to be a layering polish - I like the different sized glitters in it though!